Earthquake insurance in Utah is on everyone’s mind lately with the increasing frequency of earthquakes worldwide, especially since most of Utah’s population lives on a major earthquake fault called the Wasatch Fault Line. How Many Earthquakes are in Utah? According to the University of Utah there are approximately 700 earthquakes (including aftershocks) in the Utah region each year. Surprisingly, only about 2% of the earthquakes are felt. There are about 13 earthquakes a year over 3.0 magnitude on the Richter magnitude scale. You can see a list of all recent earthquakes in Utah here. 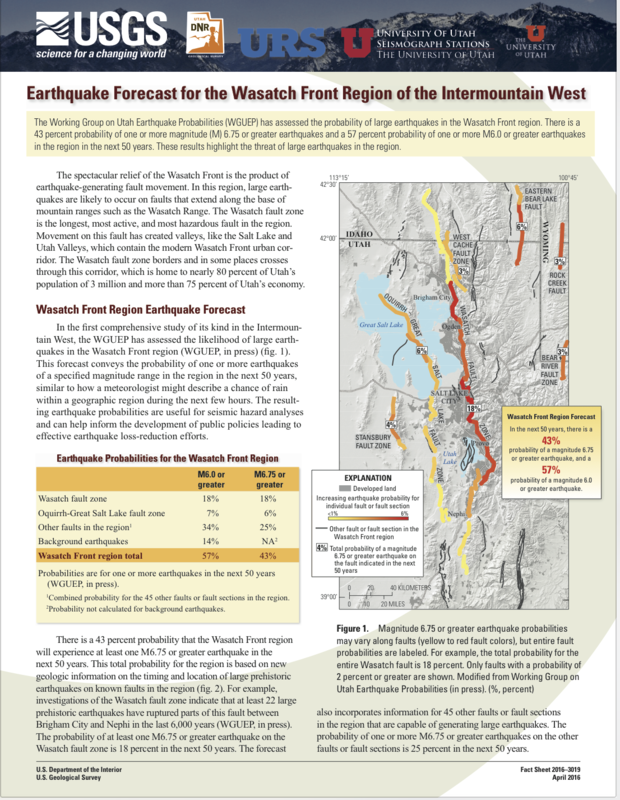 According to the Working Group on Utah Earthquake Probabilities (WGUEP), there is a 57% probability of one or more M6.0 or higher happening in the region in the next 50 years. Joe Dougherty, spokesman for the Utah Department of Emergency Management also said recently “It has been about 300 years since the last one happened and they happen about every 300 years along the Wasatch fault”. What Do I Need To Know About Earthquake Insurance in Utah? Here’s what you need to know when purchasing Utah earthquake insurance: You need to be aware of the deductible and waiting period that may apply with insurance application. The Utah Department of Insurance estimates that only 18% of homeowners have earthquake insurance because it’s expensive. The deductibles are applied much differently than a simple dollar amount, and they will differ widely from company to company so make sure that you’re aware of your out of pocket cost if / when the “big one” hits. In Utah it’s also typical to have a mandatory waiting period of 30 days before your earthquake coverage will kick in. This means that if we begin to have tremors, it’s normally not even possible to obtain coverage within the time that the tremors will affect us. It’s important to plan ahead and ask yourself the “what if” question now on this coverage in particular. Does the Insurance Company Even Offer Earthquake Insurance? Not all home insurance companies will allow you to add Earthquake coverage. If that’s the case then there are other insurance companies that will cover natural disasters to help fill the gap in coverage. Talk to your agent to find out what options are available to you. Ever since about 1994, earthquakes have been increasing in frequency exponentially. Many speculate what could be causing this increase, but regardless of the cause, you need to get prepared with earthquake insurance in Utah as well as material supplies. It’s common to talk about emergency preparations that involve 72-hour kits, food and water storage, etc. but along with that you’ll still need a place to live and a way to replace your belongings. Since homeowners insurance policies exclude coverage for damage caused by an Earthquake, many homeowners would be left without shelter or any way to rebuild their homes. It’s important to take a look at adding this coverage back onto the policy so that you’re not left without the means to rebuild. When you add Earthquake coverage onto your policy, it could also pay additional expenses for temporary housing, meals, and transportation until your home is able to be lived in again. This could make an otherwise impossible situation bearable, and will make a huge difference in the way that your family moves forward after an earthquake. Because earthquakes are so random, little can be done to predict cause or frequency. The main factors that are considered when deciding earthquake insurance policy rates are the environment, historical results, and building construction. The more you own, the more risk you have. 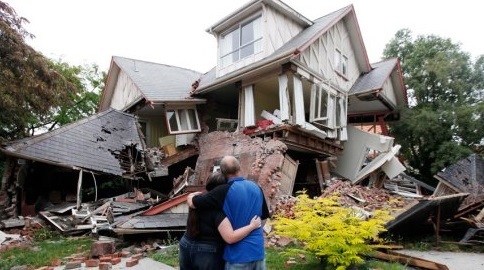 Make sure your Utah earthquake insurance policy covers everything you need. Since we do live in a potentially volatile seismically active state in Utah, it’s wise to be prepared for the short-term with emergency supplies, as well as the long-term with earthquake insurance to cover your dwelling and other belongings. At Keystone Insurance Services, we have several options for packaging the earthquake with your home insurance, as well as stand-alone natural disaster coverage. We will look at your unique situation and find what the best fit is for you. Fill out the form below and select Earthquake to setup a time to discuss how Earthquake Insurance can work for you.